When the chicken wing dip debate rages on, come together over this Blue Ranch Chicken Wing Dip that is a combination of the two most popular dips. Complete with a sprinkling of carrots AND celery! It’s officially football season in our house and we are so excited because, for the first time in 41 years, our team is 2-0 in our conference!! This is only fueling our excitement when Saturdays come and we gather in the living room all decked out in our team colors. 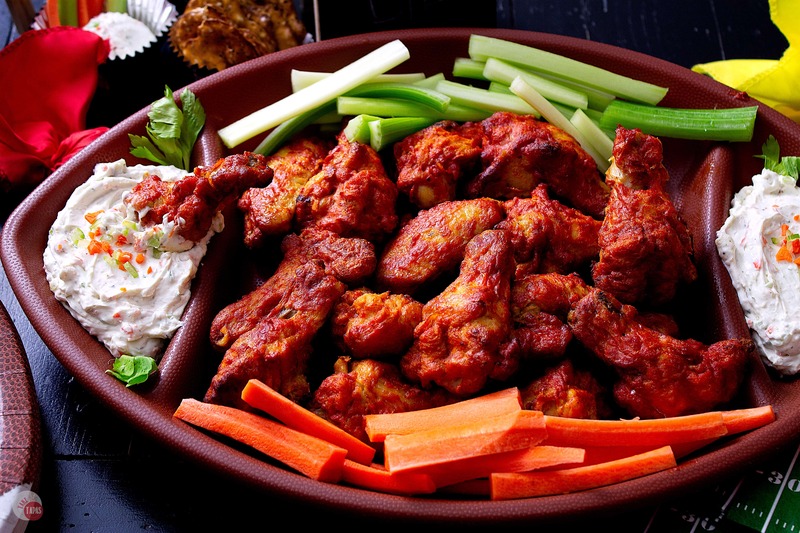 In the midst of our excitement for watching the game and chowing down on our favorite football foods – chicken wings, a marriage old debate comes to the surface. 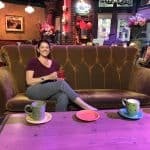 I don’t know about you but this debate can be polarizing and can split people along couch lines. Confused? No, it’s not about the color of team pants or what constitutes excessive celebration in the end zone. I’m talking about blue cheese versus ranch dipping sauce. You can also say that carrots versus celery sticks is another debate that depends on the dipping sauce served, so I settle this one too! I don’t know about you, but this is a very serious debate in our house. In an attempt to come together to cheer on our team’s winning streak, I am bringing our debate to an end with a Blue Ranch Chicken Wing Dip! 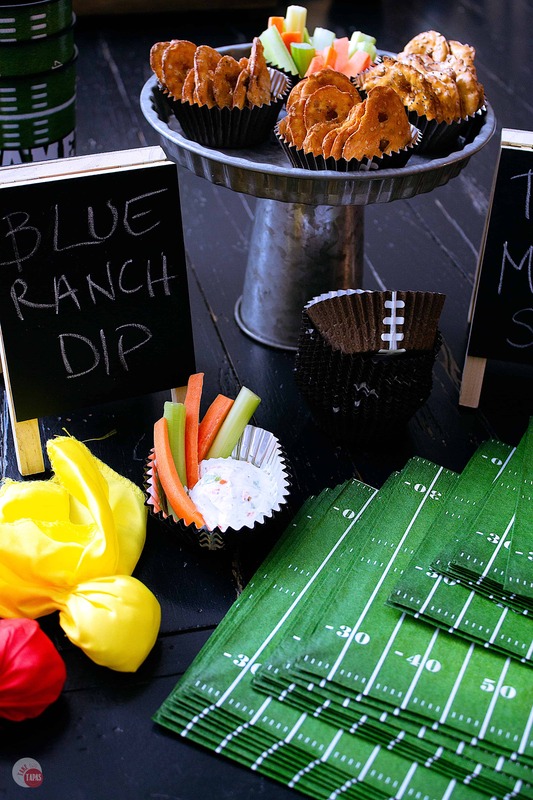 Just take me to the Bleu Ranch Chicken Wing Dip Recipe Already! If you’d rather skip my (very helpful, I think) tips and tricks, essential cooking info, and similar recipe ideas – and get straight to this delicious easy Bleu Ranch Chicken Wing Dip recipe – simply scroll to the bottom of the page where you can find the printable recipe card. 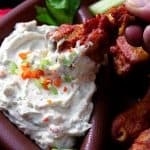 While I am throwing so much effort into making the dip a successful union of flavors and opinions, I don’t have time to stress about all the other aspects of tailgating. Not going to stress over a large spread of foods, a variety of drinks, extensive decoration, or having a sparkling clean house. I just want to serve great food and spend time yelling at the referees. To keep my stress level down, I shop at Walmart. 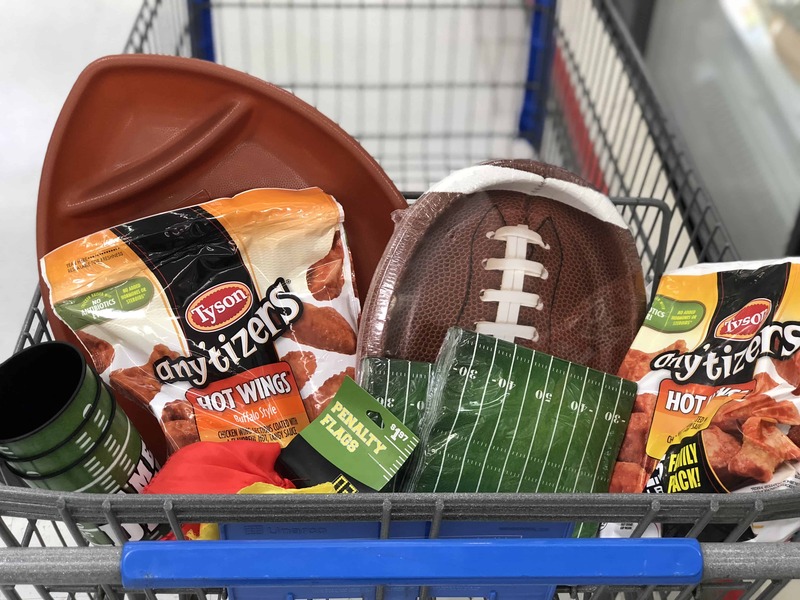 There I can grab my Tyson® Any’tizers® Buffalo Style Bone-In Chicken Wings in the freezer section, both regular and the convenient family-sized package, head to the dairy section and grab the cream cheese and sour cream for the dip. 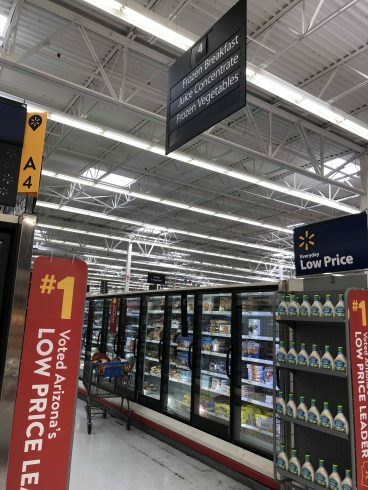 Before leaving Walmart I grab my celery and carrots, which is another bone of contention, and a stop in the party section for affordable and festive decorations! You don’t have to go all out on decorations! Keep it simple and let it be about the friends, family, and food! Once you have all the necessities, head home from Walmart and let’s start making the Blue Ranch Chicken Wing Dip! 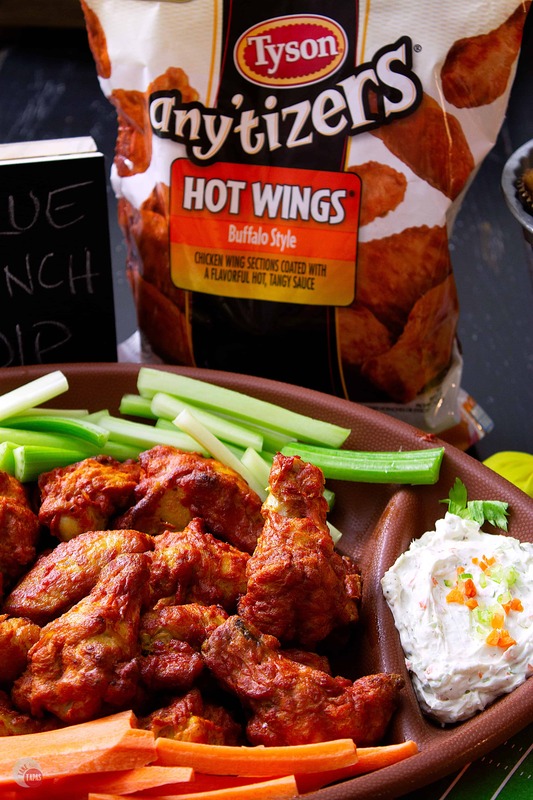 The Tyson® Any’tizers® Buffalo Style Bone-In Chicken Wings speak for themselves and being that they are on the spicy side, we need a simple dip to assist them and cool them down a little. This Blue Ranch Chicken Wing Dip starts with cream cheese and sour cream like most do. The addition of ranch seasoning and blue cheese crumbles brings two great flavors together in equal portions so it can be enjoyed by blue cheese AND ranch lovers alike. To add a little texture to the Blue Ranch Chicken Wing Dip, and settle the other debate of carrot or celery sticks, I add some of each. 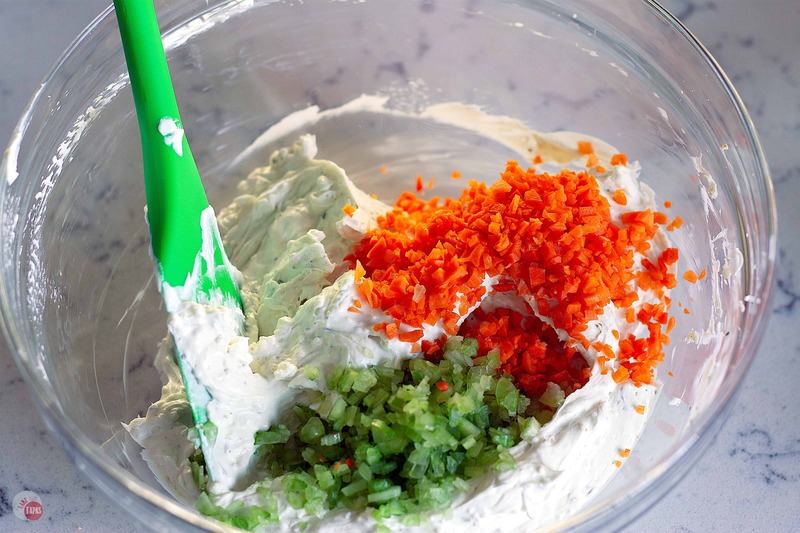 Finely chopped celery and carrot really round out the dip! It’s so good you can even serve it with pretzels, chips, or even carrot or celery sticks by themselves. This Blue Ranch Chicken Wing Dip is easy to make, contains simple ingredients, and can be made up to 4 days in advance to keep your stress levels low. Not only does this dip keep things simple, but serving Tyson® Any’tizers® Buffalo Style Bone-In Chicken Wings will also keep it low too! Delicious, convenient, and perfect for your football tailgate, or ANY Fall Entertaining occasion. A: If it is stored in an air-tight container in the fridge it will last for 5 days. Q: Can I use store-bought ranch or bleu cheese dressing? A: You can. If you need to use a store-bought one, I would use ranch and add blue cheese crumbles to it. This is just a taste preference on my part. You can absolutely use blue cheese dressing and add a powdered ranch dip mix to it. Q: Do I have to add the carrots and celery to it? A: Nope. You can leave out one or both if you prefer. Q: Can I use this dip for other chicken wing flavors? A: Yes you can! 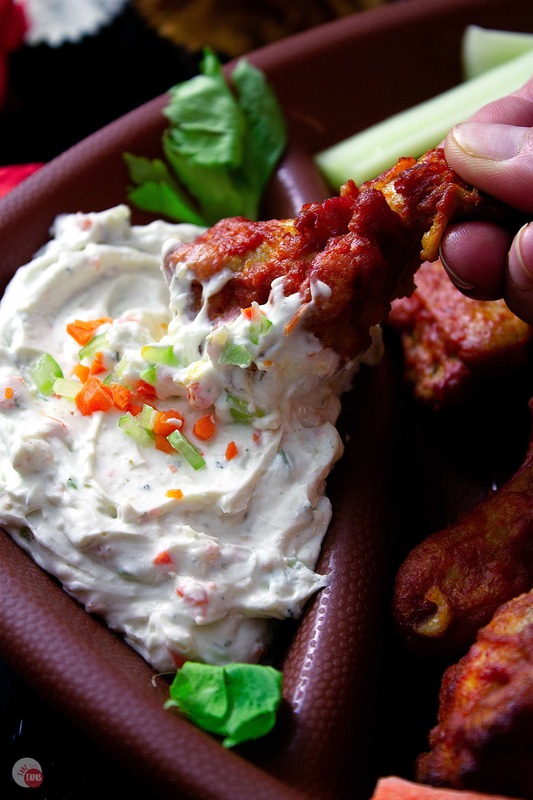 Lots of different chicken wing flavors go great with ranch, blue cheese, and both! 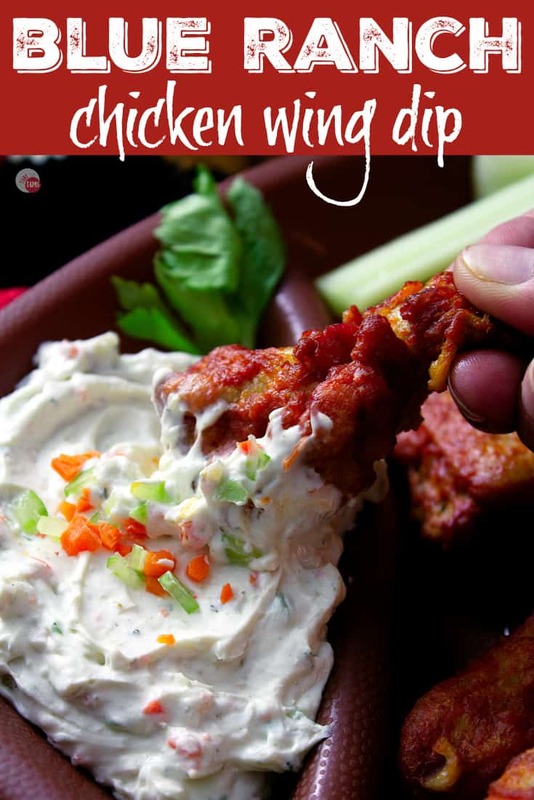 Other great Chicken Wing Dip recipes to try! If you love this easy Bleu Ranch Chicken Wing Dip Recipe as much as I do, please write a five-star review in the comment section below (or on Pinterest with the “tried it” button – you can now add pictures into reviews, too! ), and be sure to help me share on facebook! 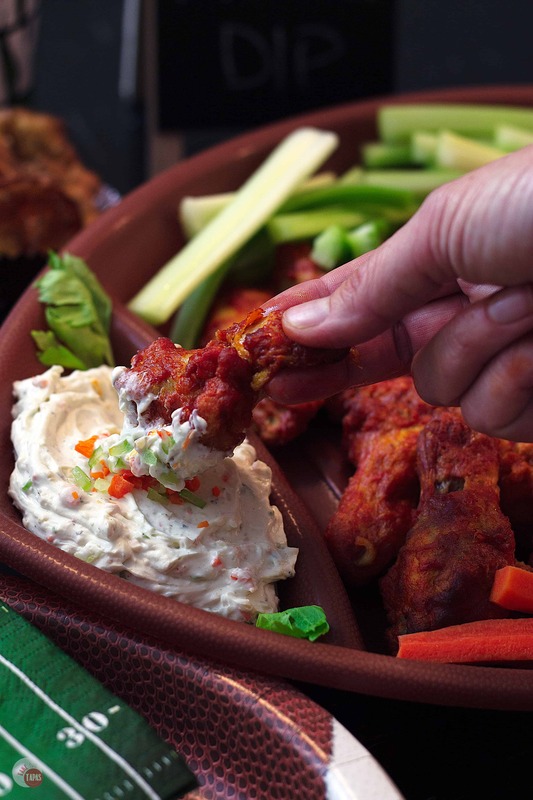 Spread the Tyson® Any’tizers® Buffalo Style Bone-In Chicken Wings in a single layer on the prepared sheet. Bake according to package instructions and to your level of crispiness. Serve with the Blue Ranch Chicken Wing Dip! In a medium-sized bowl, combine the cream cheese, sour cream, ranch seasoning, and blue cheese crumbles. Fold in the finely chopped carrots and celery if you like. 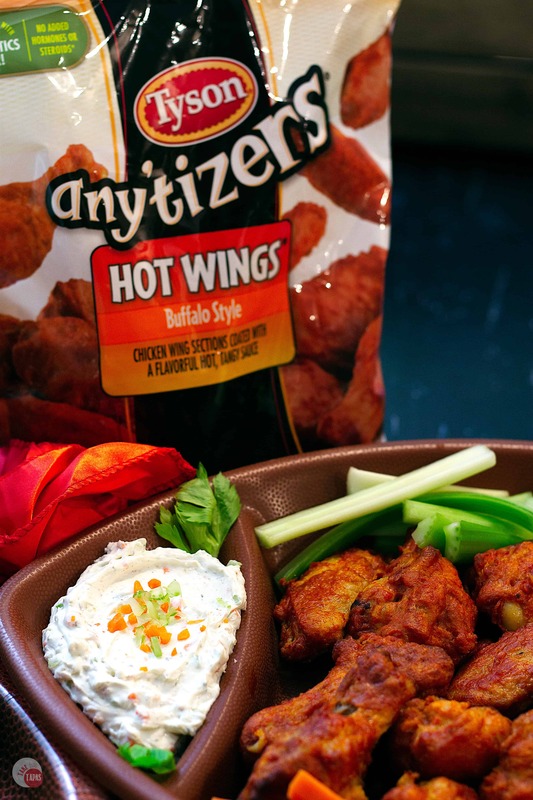 Serve with Tyson® Any’tizers® Buffalo Style Bone-In Chicken Wings! Nothing says football food like wings do!! I am loving that dip!! You combined two “dressings” so I don’t have to choose, or double dip, and the carrots and celery are one of the best parts! Brilliant idea … happening for us this weekend! What a great idea. Can’t wait to make it.